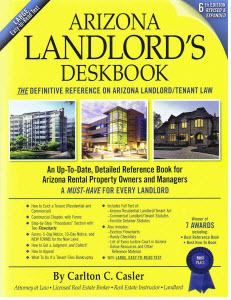 Arizona Landlord Tenant Blog: Which is "better" to serve on a tenant: a 5-Day Notice to Pay or Quit or a Notice of Abandonment? Which is "better" to serve on a tenant: a 5-Day Notice to Pay or Quit or a Notice of Abandonment? A 5-Day Notice to Pay or Quit (referred to herein as a "5-Day Notice") can be served upon a tenant as soon as rent is delinquent. If rent is due on the first day of the month and is not paid on the first day of the month, then the landlord may (but is not required) to serve the tenant with a 5-Day Notice on the second day of the month. What if there is a late fee provision? No difference. A late fee provision specifies when late fees will be assessed and the amount thereof. A lease is not required to have a late fee provision and many lease forms do not include a late fee provision. If the late fee provision had any impact on when the 5-Day Notice could be served, then rent would never be delinquent in a lease with no late fee provision. A Notice of Abandonment can be served on the tenant if the tenant is absent from the dwelling unit without notice to the landlord: (1) for seven days, if rent is delinquent for ten days, and there is personal property belonging to the tenant inside the dwelling unit or (2) for five days, if rent is delinquent for five days, and there is no personal property belonging to the tenant inside the dwelling unit. A landlord may serve a 5-Day Notice or a Notice of Abandonment if the foregoing requirements are met. Sometimes both will apply. For example, if rent is delinquent five days, the tenant has been absent from the dwelling unit without notice to the landlord for five days, and there is no personal property inside the dwelling unit. Measured against the foregoing criteria, both seem to apply. So what should the landlord do? Which is the better choice? My recommendation is to do both. If you just do the Notice of Abandonment and the tenant shows up three days later, you cannot proceed with the abandonment and you have lost three days because you did not serve a 5-Day Notice at the same time as the Notice of Abandonment. If you serve both notices at the same time, you can defer the decision on which course of action to pursue until five days later. A word on "service" of these notices. a. The 5-Day Notice can be serve via certified mail and hand-delivery. When served by hand-delivery, you begin counting five business days, beginning the day after hand-delivery to the tenant. When served via certified mail, you begin counting five business days, beginning the day after the tenant signs for the certified letter or five business days after the Notice of Abandonment was sent via certified mail to the tenant, whichever occurs first. b. The Notice of Abandonment must be posted on the front door (or other conspicuous entry point) of the rental property and sent on the same day via certified mail. Counting of the days is the same as above. If the landlord proceeds with the abandonment, then the landlord can get possession of the rental unit in about two weeks, but the landlord loses the opportunity to get a money judgment against the tenant. The landlord can still sue the tenant in a regular civil action later and get a judgment for rent, late fees, damages, etc., but a regular civil action takes several months, rather than just a couple weeks. If the landlord proceeds with the 5-Day Notice, then the landlord can file an eviction action and get a money judgment against the tenant (assuming, of course, that the landlord is the prevailing party at the eviction hearing) for rent, late fees, attorneys fees, and court costs. Typically, you cannot get cleaning expenses or property damages because the landlord does not yet have possession and has no way of knowing the extent of the cleaning and/or property damage at the time of the eviction hearing. The landlord can file a regular civil action for additional rent (if the tenant vacated before the end of the lease term), cleaning expenses, property damages, etc., if the security deposit does not cover all of the landlord’s money damages. So which one is "better"? - If you want a money judgment, and you want it as soon as possible, then you want to serve a 5-Day Notice and then file an eviction action if the tenant does not pay the amount due within the five days. This choice will get you a judgment. - If you want possession of the rental property as soon as possible and you do not care about getting a judgment against the tenant (either because you intend to file a regular civil action later or because you don’t believe you will ever be able to collect anything from this tenant), then follow the abandonment procedure. This choice will get you possession sooner than if you file an eviction action. Appreciate it for all your efforts that you have put in this. Very interesting info.